Introduction: At ICAST 2005, we, along with the rest of the fishing industry, were introduced to Kistler's brand new line of technique specific Magnesium line of rods. Well, it took some time, but we finally managed to get our hands on one of these sticks and put it through a new series of checks and balances in an effort to bring to you, our readers, a more tangible analysis. How did the new Kistler Magnesium TS stand up to our new methodology? Sit back and visit with us as we take you through what is the Kistler Mg 6' 6" All Purpose Special. Length from Front of Reel Seat to Tip 66 1/2"
Impressions: In response to the continuing demand for technique specific bass fishing rods, together with repeated requests for a value line of sticks with similar attributes to that of their original Helium series, Kistler Custom Fishing rods has gone overseas and located a factory in tune with their own rod building ideals. The result is Kistler's new Magnesium TS series built on a proprietary graphite blend and featuring stainless steel guides with ceramic inserts, Kistler's traditional no-foregrip design, and a split rear cork grip, all at price point that is roughly $50 less than their original Helium line. The number of rod manufacturers heading overseas seeking an economical solution to the assembly of their rods is growing every year. The benefit to us, the consumer, is an increasing level of quality from these factories, and a product that is much more affordable. The Kistler Magnesium TS is one such example. The build quality of our test rod was superb and were it not for the fact Trey Kistler himself informed us this rod's origins laid overseas, we would not have suspected otherwise. Lab Tests: Always striving to bring you, our readers, the best in objective, independent analysis, 2006 marks the year in which we debut some new rod testing metrics. As the basis for our comparisons, we look to G.Loomis, which has long been the industry benchmark, to serve as our baseline for comparison. The rod we chose for our baseline set of data in this review? 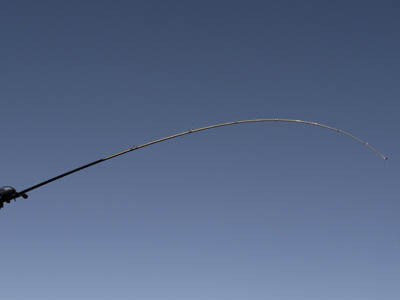 None other than G.Loomis's own 6'6" medium heavy stick, the MBR783C GLX (Fuji Reel seat model). Rate of Deflection (RoD): At the heart of our new tests is a metric we refer to as the Rate of Deflection or RoD. 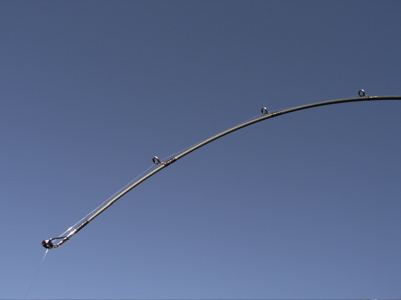 This number is the ratio of the amount a particular fishing pole bends divided by a pre-determined load, and is not meant as a stand alone metric, but rather, it is intended for use in comparison with other rods sharing similar lure weight ratings. 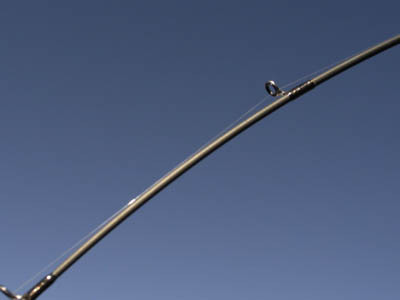 We first, incline the test rod at a fixed angle to mimic how it would be held while fishing. We then mount a reel, line the rod, lock down the drag, and apply the pre-determined amount of pressure to the end of the line and take our measurements. In the case of our MgAPSMH66, we measured twenty-six (26) inches of deflection with sixteen (16) ounces of pressure for a RoD of 1.6. Our baseline test rod, the MBR783C GLX measured twenty-eight (28) inces of deflection with this same amount of pressure for a RoD of 1.8. So, the bottom line here is the lower the number, the more powerful the blank. As we can see in the table above, the MgAPSMH66 actually tested out to be slightly more powerful than our MBR783C GLX. 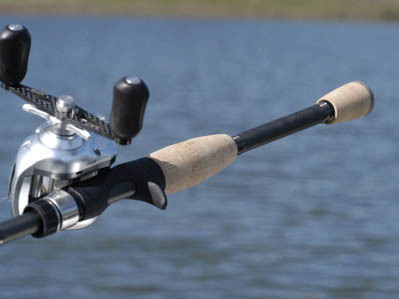 Action: One of the more obscure rod ratings for many consumers is the notion that rods have an action of fast, moderate, slow, etc.. Many confuse this rating with that of Power. Simply stated, a rod's action is used to describe how far down the rod will bend at the tip before you reach its backbone. The less bend, the "faster" the tip. We found it interesting that while our MgAPSMH66 had a RoD measurement less than that of the MBR783C GLX indicating the blank is slightly stiffer or less flexible, the MBR783C GLX actually had about half an inch less tip than that of the MgAPSMH66. This means the MBR783C GLX has a slightly faster taper but both blanks, when run through our actual calculation, featured tips that bent down in the range of 25% of the rod's overall length. This is right on the fence with the general definition between a fast and extra-fast action rod so both are consistently rated. Line Slap: We hear a lot of chatter regarding the number of guides on a rod, their placement, spacing standards, etc.. As fisherman, what's important to us, obviously, is performance. This is why we present to you our field tests with every product. However, an interesting metric with regards to guide placement on casting rods with a conventional wrap (guides up), is at what amount of pressure do we experience the touching of line to blank? This is of concern because the friction caused by this phenomenon must undoubtedly affect the longevity of the blank. 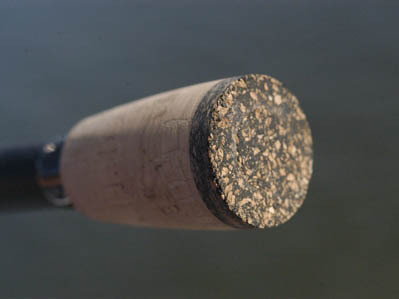 The height and spacing of the guides on a rod can help alleviate this occurrence, but given the design of rods wrapped in this manner, it is an inevitable event. How then, did our two rods perform? Surprisingly, given our MgAPSMH66 has one less guide than our MBR783C GLX, it took much more pressure to induce line slap on this rod than it did with the Loomis. In fact, it took surprisingly little pressure for the GLX to experience line slap.